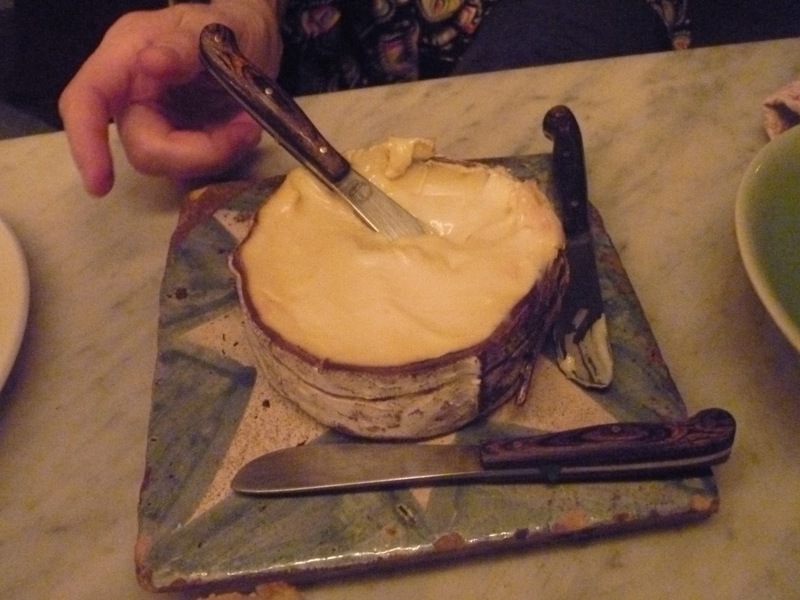 Wrapped in Elm Bark, served at room temperature, you carefully cut off the top of a wheel of Rush Creek Reserve to reveal a pool of creamy, cheesy, ambrosia that you can spoon out – either directly into your mouth or onto a piece of bread. This cheese is made from winter milk (cows eat hay instead if grass) by Uplands Cheese Company in Wisconsin. Quantities are very limited I’m only aware of one place that is selling it here in NYC (I’m sure there are more) which is Saxelby’s, but at this point I wouldn’t be surprised that by the time their minute weekly shipment comes in they are all already spoken for! I think Anne said that this week they were getting a meer 8 wheels ($29 a wheel and worth every penny). This cheese is really special so if you do have the opportunity to get some – I think it’s worth the splurge. This entry was posted in NYC and tagged Rush Creek Reserve, Saxelby Cheese. Bookmark the permalink.